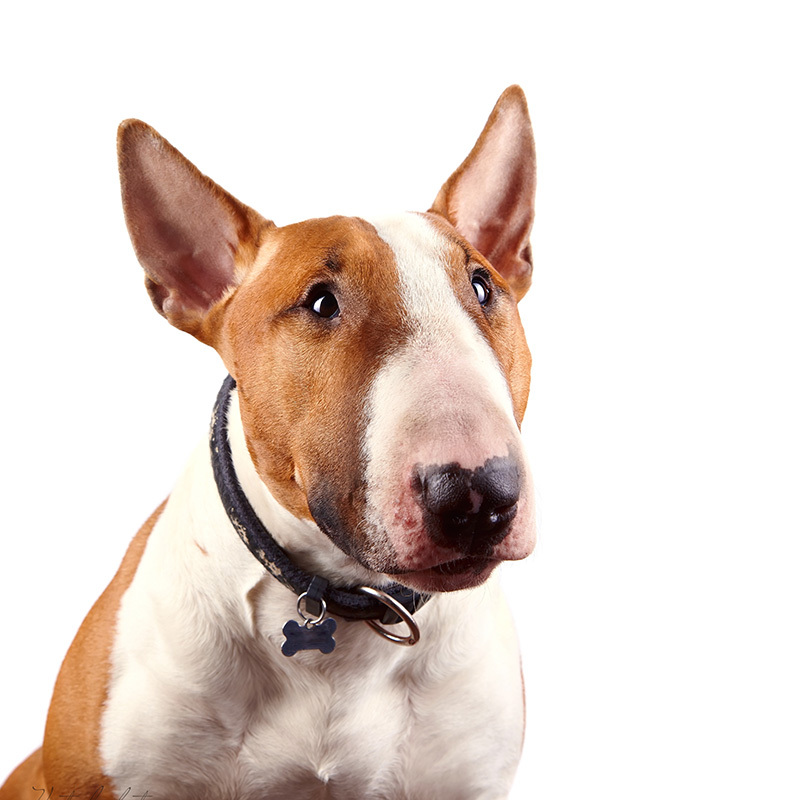 Bull Terriers were developed due to the popularity of bull-baiting in Great Britain. In 1835, lovers of this sport decided to create a fierce gladiator by crossing a Bulldog with the now-extinct White English Terrier and a bit of Dalmatian. The Spanish Pointer was added later to increase their size. In 1860, a gentleman by the name of James Hinks created the white-coated variety, which was named the “White Cavalier” because of its courage in the dog-fighting ring and civility towards people. The colored variety was created by back-crossing them with brindle Staffordshires. Today, after decades of selective breeding, the Bull Terrier’s killer instinct has been greatly diluted. The Bull Terrier is friendly, sweet, and fun-loving. They are known for their clownish behavior and are goofballs at heart. They are extremely attached to their family and are very protective of them. They love children, but can easily knock them down with their rough and tumble ways. They love to join in family fun and are tireless playmates. The Bull Terrier can also be stubborn, so you’ll need to be the leader of the pack with this dog. If someone were to break into your house, a Bull Terrier would definitely defend you and yours, no matter the odds. This dog makes a wonderful family pet, as he is happy, energetic, and quite the clown. Just be aware that they are known as “the kid in a dog suit,” and they act like a puppy until they’re about three years old. The Miniature Bull Terrier usually weighs up to 20 pounds and stands approximately 14 inches tall, while the Bull Terrier usually weighs between 45 to 65 pounds and stands approximately 12 to 18 inches tall. They have a very solid, muscular build with short legs and a long, wide muzzle. They have extremely short hair, which is either solid white or with spots. The Bull Terrier’s popularity soared through the roof when the mascot for Budweiser “Spuds Mackenzie” turned into a pop icon. Previous owners of Bull Terriers were George C. Scott, Presidents Theodore Roosevelt and Woodrow Wilson, and author John Steinbeck. One well-known Bull Terrier was Patsy Ann, who greeted each ship that docked in Juneau, Alaska during the 1930s. It is said that she was photographed more times than Rin Tin Tin. She became the official greeter of Juneau in 1934, and was memorialized on a bronze statue in 1992 which resides today on the Juneau wharf.